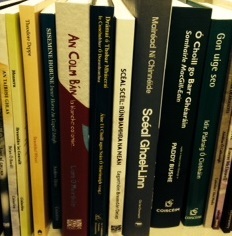 Some of the Irish language books received in April. Here are some of the titles just in. This is a “sneak preview” — they are not cataloged, so if you want a book soon, place a request and it will move to the top of the queue. Lebor na Cert: Reassessments / Kevin Murray. 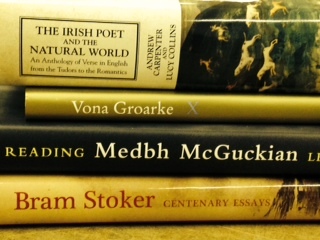 Irish Texts Society (Subsidiary Series). An Reifirméisean, na Protastúnaigh agus an Ghaeilge 1534-1800 / Roibeárd Ó hÉanna. Privately published. Rabhadh! Dánta / Alan Titley. Coiscéim. An Colm Bán / Liam Ó Muirthile. Coiscéim. Clerical and learned lineages of Medieval Co. Clare: A survey of the fifteenth-century papal registers / Luke McInerney. Four Courts. Laurence O’Neill (1864-1943): Lord Mayor of Dublin (1917-1924):Patriot and man of peace / T. Morrissey. Dublin City Council with Four Courts Press. Reading Medbh McGuckian / Leontia Flynn. Irish Academic Press. Bram Stoker: Centenary essays. Edited by Jarlath Killeen. Four Courts. X / Vona Groarke. Gallery Press. Working with the O’Neill Collection, I have more questions than answers. How was music printed and sold in Ireland? 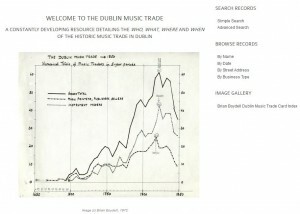 So I was very happy, browsing through the Journal of Music, to learn of a new website called The Dublin Music Trade. This is based on a card index developed by the late Brian Boydell, of music publishers, printers, sellers and instrument makers in Dublin from 1750 to 1850. The database has been developed by his son Barra Boydell, and later by Dr. Catherine Ferris. It appears from the website that while Brian Boydell’s original card index covered one century, this database is expanded to include earlier years, back as far as 1515. In addition to the search facility, it is possible to browse through lists, so for example we can see all 17 listings for Capel Street, or listings under category, e.g. Musical Instrument maker: Flute, which also has 17 names. This database, hosted by the Research Foundation for Music in Ireland, will be of great assistance to anyone working with the Francis O’Neill Collection in our library.